In what is expected to be a competitive race for California's 7th Congressional District, the Republican challenger has issued a challenge to the three-term Democratic incumbent. According to a press release issued yesterday, the campaign for Republican nominee Andrew Grant said that on Friday, July 13, a letter (posted below) was hand-delivered to Dr. Ami Bera seeking a series of debates. Specifically, Grant challenged Bera to five debates starting no later than August 15. 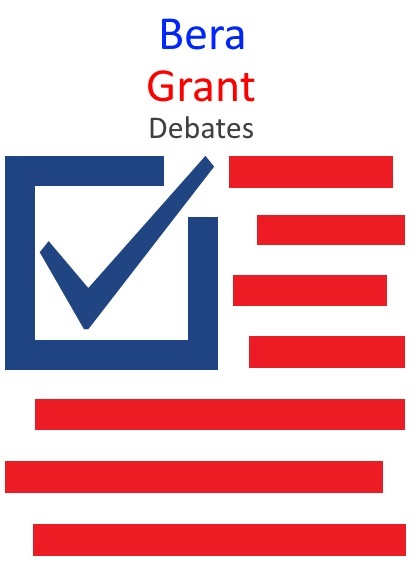 “I believe five debates to be a fair opportunity for people in District 7 and the region to clearly see our differences - and I expect Ami Bera to agree," Grant said. Grant took a page from Bera's 2010 playbook when he challenged Lungren, who at that time was seeking his fourth term representing the district. Lungren did not agree to Bera's challenge and won that election but was defeated by Bera in 2012. When reached for comment, Bera's campaign manager Will Van Nuys noted the congressman regularly holds town hall meetings in-district, is open to a series of debates and did not reject the proposal out of hand. "In addition to town halls and meet and greets, Congressman Bera has always participated in debates," Van Nuys said. "We look forward to working out the logistics to do the same this year, and are excited for the exchange of ideas." Since 2010, the 7th has consistently been one of the nation's most competitive congressional district, and at times been one of the expensive congressional contests. While Bera lost to incumbent Lungren in 2010 by a narrow margin, he won the three following races starting in 2012 against high-profile Republicans Lungren, former Congressman Doug Ose, and Sacramento Sheriff Scott Jones by razor-thin margins. The well-regarded non-partisan Cooks Political Report includes the district in its list of competitive house races, but rates it a likely Democratic, its highest rating for competitive races. Other nearby California congressional districts included on the list include the 4th district, which is represented by Republican Tom McClintock, is listed a likely Republican; and the 10th district in San Joaquin County represented by Republican Jeff Denham is rated as a toss-up. While having five debates would be civic minded, short of one of the candidates committing some sort of gaffe, it is unlikely most voters would pay attention to more than one meeting. Nonetheless, Mr. Grant should be careful what he wishes to happen. While Dr. Bera is far from a skilled debater, he will undoubtedly invoke President Trump at every opportunity and try to box Mr. Grant into a corner, particularly given his background and focus on national security issues. That could be a big obstacle to overcome.